Since it was released and I missed it in theatres, Kumiko has been on my must-watch list. The plot alone was enough to pique my interest, regardless of anything else, and I wanted to see what would happen given the extremely odd premise. For those of you who don’t know much about the story behind the film, I’ll lay out a summary soon, as I always do, but here’s a sneak peek; Fargo. Any movie that uses Fargo as a base has got my attention, as I am a huge Coen Brothers fan. I know that’s not exactly original, and yes we share the same last name, but I won’t be dishonest just because it’s typical; I think the Coen Brothers are geniuses and I love their movies. Well, some of them anyway, especially The Big Lebowski and Inside Llewyn Davis. So I was really hoping that somehow Kumiko would be an offshoot, or a homage, or at least lean heavily on Fargo since Zellner is a relative amateur, and not just use it as a springboard. Unfortunately the latter happened and the film wasn’t exactly what I wanted. Not its fault perhaps, but there’s more here to criticize than just its lack of accented Northerners. Kumiko is, without a doubt, the oddest Japanese woman you’re ever likely to see gracing the snowy streets of Minnesota. And how she got there is even stranger. Kumiko lives in Tokyo, works as an Office Lady for a corporation, and doesn’t seem to fit in with those around her. Her co-workers are rising up the ladder, or else getting married & having babies, something Kumiko’s mother would be only too happy to see happen. But Kumiko is stuck, and it doesn’t look like she has the capacity to change that. She lives in a tiny, messy apartment with her pet rabbit, avoids social contact as much as she can, and, oh yeah, it obsessed with a VHS copy of Fargo that she plays continually, writing down details and making intricate maps. She thinks that the money Steve Buscemi’s character’s buries in the snow is actually there, that it’s real, and that if she goes to claim it her life might just take on some sort of meaning. And so she travels to Minnesota with the dream of finding the briefcase full of cash and finally beginning her life. But it won’t be easy, even setting aside the fact that the “treasure” is from a Hollywood movie and, of course, doesn’t exist. First she’ll have to get to the US, something her boss’s business credit card should help with. Next she’ll have to find out where the city of Fargo is and who will help he get there, without being able to speak more than a word or two of English. The people she meets along the way are actually very friendly & helpful, if a bit strange, but not even good intentions can help this confused girl. Kumiko refuses to accept that she might not reach her goal, or that if she does reach it, there might be nothing there. And so the journey continues, across the winter landscape of the northern tundra, to a climax that’s sure to be as strange as the main character herself. I’ll quickly address my disappointment in the plot of this film, because that’s mostly a Me Issue; I just wanted more Coen Brothers. I wanted that style in the story (but without copying it), I wanted a little comedy to relieve the tension, I wanted odd characters setting a twisted table. Or, lacking that, I wanted clips from Fargo, some references, a nod in that direction, and not just a quick Paul Bunyan statue sighting. Basically, I wanted the premise of this film to be a little more about what was advertised and a little less stand-alone. I understand now what the director was going for, and it definitely wasn’t the spinoff that I was hoping for. Kumiko uses Fargo as a step in what is ultimately a totally different direction. And while that’s fine, I wish I could say that the new direction was pointed towards something wonderful, but I can’t. The first problem was that Kumiko was the sole character. She met others along the way, people who had their own troubles, if not quite so visible as hers, but none of them really affected the story, her journey, her personality, her decisions, or the outcome of her search. She was so closed off, had so many issues, that the world was within her head alone, never touched by the outside or by the reality of the situation. In a way, the movie became like a very unfunny version of Welcome to Me. That might sound odd, but both films are dealing with mental illness more than they appear to be on the surface. Kristen Wiig’s character had borderline personality disorder, and the movie became about that once audiences were sucked in. I don’t know what psychologists would diagnose Kumiko with, but she’s not well, the movie makes that clear, and so that becomes the forefront of the tale, when that was the last thing I expected or wanted. And putting over-anylization aside while attempting to be completely honest, the movie was pretty boring. Kumiko was in a terrible place mentally, traveled to a terrible place for her physically, and proceeded to slowly lose herself, her mind, her grasp, and, ultimately, her audience. Video – With an aspect ratio of 2.35:1 Widescreen 1080p, the video quality of the Blu-ray is top-notch. The film was shot using an Arri Alexa Plus 4:3 camera with Cooke Speed Panchro, Xtal Express, and Cine Varotal lenses. 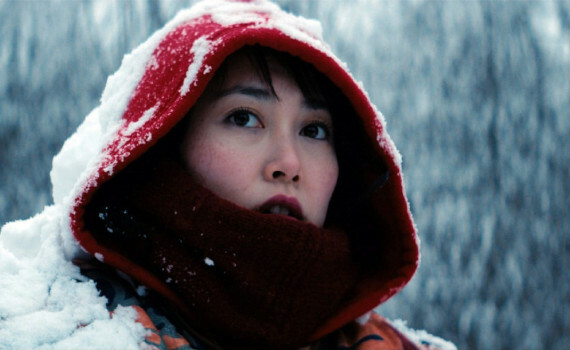 The visuals of the movie are pretty spectacular, with Kumiko in her iconic red jacket against a backdrop of either drab city of snow-covered countryside. That imagery aside, the picture quality was strong on its own, with nice color, light, and use of camera. The story was very personal, all about Kumiko, and the video highlighted that. Audio – The Blu-ray was done in English Dolby TrueHD 5.1 audio, with an option for English SDH or Spanish subtitles. Also, audio commentary can be activated, with Writer/Director David Zellner, Writer/Producer Nathan Zellner, & Producer Chris Ohlson. The sound quality is like the sound of the film itself; understated. Dialogue was quite, music was minimal, and the mood of the film flowed through Kumiko’s actions, not her words. What music there was offered a relaxing soundtrack to a volatile tale. Extras – There are very few special features on the disc, only a Deleted & Alternate Scenes section that lasts 7 minutes total. Skip It. Kumiko, the Treasure Hunter is based on a true story, or at least partially true. In 2001, a young woman named Takako Konishi traveled to Minnesota from Japan for unknown reasons, though they most likely had to do with an ex-lover. The story of her search for the Fargo treasure became an urban legend and eventually launched this movie. Either way, something along these lines happened, including her encounters with local police, and a very strange story was born. Kumiko, like the actual woman involved, was troubled by a variety of unhappinesses and mental disorders, leading to her being in an odd place for odd reasons. This film was widely liked and appreciated as an original piece of cinema, but whatever it was that others got I missed. This wasn’t what I wanted, I was underwhelmed by the depth of the story, and ultimately I was bored by the sole character. The video quality was excellent, the audio fine, and there weren’t many extras on the disc. Be cautious with Kumiko; it’s not what you think, it treads upon a fragile issue, and it simply isn’t that exciting.